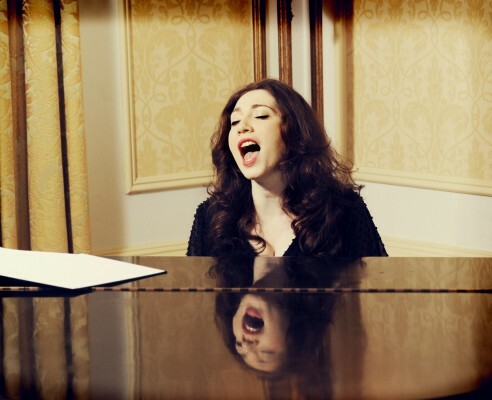 Last week, before the storm, I caught Regina Spektor at The Beacon Theatre. It seems so long ago, yet in my social media Sandy haze, it’s only now that I bring myself to write this review. While my area stayed out of harm’s way, somehow not being able to leave the apartment made it hard to do much of anything. I saw Spektor play relatively recently at United Palace Theatre, but hers is one show I can never miss. Unfortunately from where the photographers were stationed, I wasn't able to get an adequate live shot, but the show itself was just as fantastic as the last. Spektor has this epic, melodic quality that makes you feel dreamy and somewhat lost in the moment. She spent most of her time over the grand piano mesmerizing audience members all around me. Seriously, their faces were adorable. It’s like that moment in Amelie where she looks behind at people’s face while they watch a movie and there's total audience bliss. Spektor played a various of songs, old and new, which made for a smooth, never-wanting-it-to-end kind of show. I’m newly obsessed with her single “How,” which had to be a personal highlight of the show, along with her Russian cover of “The Prayer of Fancois Villon,” which was hauntingly beautiful and felt special. In conclusion, the whole show was lovely but, wait for it...my favorite part had to be her mid-concert swipe at Romney saying, "I'm so pissed off sanity has become a lost cause." She then ironically dedicated one of her songs, “Ballad of a Politician” to him. I found it a bold move considering the surprising age diversity of her audience and made me love her all the more. Remember to go vote November 6th!